New Rochelle, NY, October 14, 2016–More than ten years of published clinical data and personal experience using PRRT-based targeted therapy of neuroendocrine tumors supports the effectiveness of this novel treatment approach and the ability to minimize and manage potential toxic side effects. 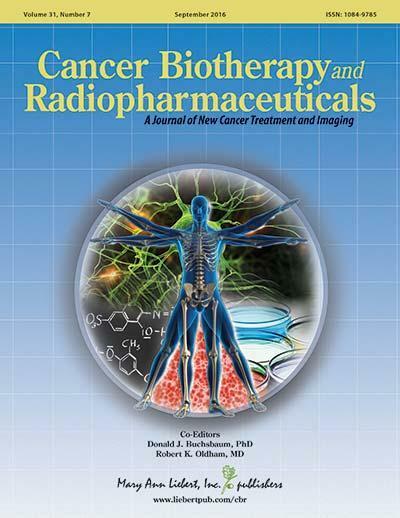 A comprehensive review of somatostatin analog peptide receptor radionuclide therapy (PRRT) is published in Cancer Biotherapy and Radiopharmaceuticals, a peer-reviewed journal from Mary Ann Liebert, Inc., publishers. The article is available free on the Cancer Biotherapy and Radiopharmaceuticals website until November 11, 2016. In the article "Myelotoxicity of Peptide Receptor Radionuclide Therapy of Neuroendocrine Tumors: A Decade of Experience," Murali Kesavan and J. Harvey Turner, The University of Western Australia (Crawley, Australia), state that PRRT has revolutionized the management of patients with neuroendocrine tumors, improving tumor response rates and patients' progression-free survival. However, the associated toxicity to blood cells – with the potential to cause thrombocytopenia and neutropenia and, in the long term, myelodysplastic syndrome and acute leukemia – remains a risk and has limited the use of PRRT. The researchers suggest that PRRT should more readily be considered a first-line agent in appropriate patients. Steps can be taken to minimize the risk of significant long-term effects, such as appropriate timing of therapy, patient selection criteria, dose optimization, and adequate monitoring. "This is an important discussion of the efficacy and toxicity issues relating to the use of PRRT, as the therapy becomes more widely available for the treatment of gastroenteropancreatic neuroendocrine tumors with radiolabeled somatostatin analogs," says Co-Editor-in-Chief Donald J. Buchsbaum, PhD, Department of Radiation Oncology, Division of Radiation Biology, University of Alabama at Birmingham.